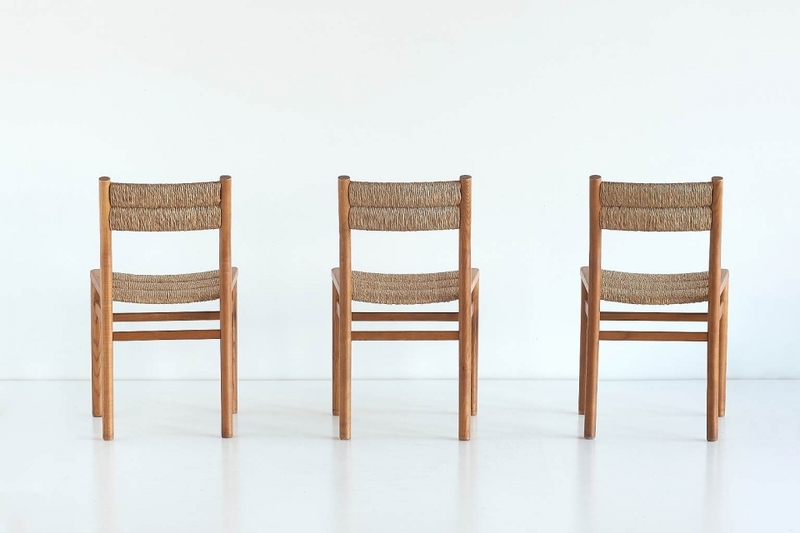 A set of six dining chairs in elm and rush, designed by Pierre Gautier-Delaye in 1956. The frames have a tilted backrest and display a striking wood grain. The original rush of the seats and the backrests has been well preserved. Biography: The young Gautier-Delaye often collaborated with the cabinetmaker Lucien Vergnères, who also produced furniture for renowned designers such as Jacques Adnet and André Arbus in his Parisian workshop. While on holiday in Les Landes (S-W France), Vergnères was observing the local traditional woodworking techniques and craftsmanship. Inspired by this and remembering his mountain holidays, Gautier-Delaye subsequently designed the Week-End series, which consisted of dining room furniture, a sideboard, a bed and a wardrobe. The designs of the successful range were simple and light yet refined in their details. Like the pine and straw furniture of Charlotte Perriand, the Week-End designs never renounce their rural origins. Bibliography: Pierre Favardin, Les Décorateurs des années 50, Editions Norma. Paris 2012. Page 214.